The world around us is dynamic and our senses are assaulted every second by different sounds, smells, tastes, experiences and of course, lots of information. We process all these inputs in our brain and this new knowledge makes us what we are. Some of it we let go of immediately as it is of no use to us. Some information we understand and store it for future use. The information that pertains to our daily sphere of living and work is at the top of our memory cache and we can retrieve it at will. However, vast quantities of information that we receive through various sources in the course of our lives are not useful or necessary on a day to day basis. We usually store it in the recesses of brain and at opportune moments recall it. This is where the problem lies. Since we are inundated with information, we can’t decide what to retain and what to relinquish. Sometimes, even if the information is useful, it is too much for our memory to process. This is where man has come up with various techniques to retain, recall and retrieve information at will. Two of the most common memory aides to recall complicated and elaborate words or phrases as also sequences of words, is by using Mnemonics and Acronyms. While both serve the same purpose, they are intrinsically different. Both help in making difficult sequences or strings of words easy to understand, retain and recall. However, we cannot confuse one with the other. Acronyms are more widely used and even a lay person would be using or knowing some, if not many acronyms. Examples of acronyms are: NASA, IBM, ISRO etc. Mnemonics would read like this: Richard Of York Gave Battle In Vain, Memory Needs Every Method Of Nurturing Its Capacity etc. Just like an abbreviation, an acronym is formed by taking the first letters of each word and creating another word to help you recall the word/ words you want to remember. The sequence of the letters is important in an acronym. Acronyms are only written in upper case letters and usually can be pronounced as a new word. Maybe the most famous acronym is POTUS – President Of The United States. Common acronyms are AIDS – Acquired Immune Deficiency Syndrome, PAGES – Public Access Gateway for Energy & Science and SAARC – South Asian Association of Regional Countries. While most acronyms can be pronounced as new words, it is possible that some acronyms can’t. A mnemonic is a memory device designed to help people, usually students, with difficult to recall information. It uses a connection between prior knowledge and new concepts through verbal, visual and acoustic clues. Acronyms can also be mnemonics along with rhymes, key words and picture association. It can be formally taught or each student can develop his own mnemonic to kick start his memory. Taken from the Greek word mnemonikos meaning related to memory, mnemonics helps as an aide to artificial memory when the natural one fails or finds it difficult to remember complex information. 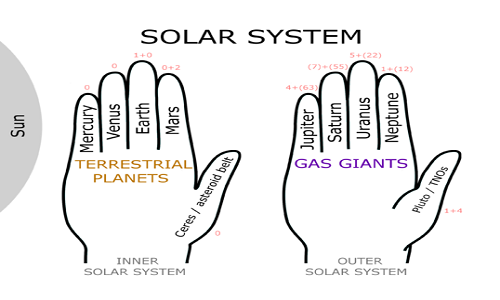 It could be something like using the knuckles to remember the number of days in each month or a unique string of words to remember the planets in the correct order. Though Mnemonics are not acronyms, acronyms are a type of mnemonics. While acronyms are made up of the first letters of all the words in sequential order, mnemonics are in the form of rhyming words or fake names. Acronyms can most usually be pronounced as a different word, while mnemonic can’t be. Acronyms are usually to remember a line of words that make up a name of an organization or disease. Mnemonics are used to memorize anything. So in conclusion, one can say that while both mnemonics and acronyms lead to increased memory, they are distinctly different in form and structure. Shanti Rao. "Difference Between Mnemonics And Acronyms." DifferenceBetween.net. June 8, 2016 < http://www.differencebetween.net/science/difference-between-mnemonics-and-acronyms/ >.